Wearables are one of the hottest trends pushing the Internet of Things. Many of us are familiar with the sensor bracelet things that keeps track of steps, distance, calories burned and all the things a pedometer used to do. 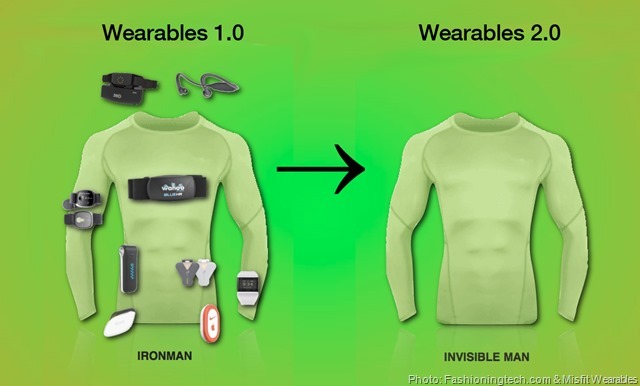 But now there are sensors stitched in to our actual clothing! Nike recently patented a shirt that provides ‘enhanced body position feedback.’ Basically you are wearing your coach as an outfit. It is a wearable instruction shirt that helps improve an athlete’s form or body positioning. A Korean artist has released a kinetic wearable, Metamorphosis, which features a woman’s dress and man’s blazer that detect when you’re drunk. When consuming alcohol, the shoulders on the dress expand and transition between different colors, while the collar on the blazer rise to hide the wearer’s face. The dress is designed to show how a female’s confidence increases when consuming alcohol but the blazer hides the male when it senses too much alcohol on his breath. I’m not incoxitated ossifer! Apathy – if you’re not motivated to change, it doesn’t matter. Simplicity vs. Complexity – You can’t just shove complex psychology into an app and expect an incredible user experience. Personalization vs. Scale – Psychology is generally applied in a clinical setting, with the best results from 1:1 interactions & does not scale. Integration with Real Life – There exists a natural barrier between doing something on your phone and taking action in real life. With 82% of American wearable tech users believing that it has enhanced their lives, I’m sure this is just the beginning of the Wearable Internet.